Arguably the best Childrens Telescope available ... equipped with surprisingly good optics! The Newtonian telescope, invented by Sir Isaac Newton in 1688, is now no longer just a scientific instrument - The Infinity 76P transforms the popular Newtonian telescope into a fun yet educational toy for our younger scientists. It offers sharp and bright images, allowing kids to easily view vibrant objects during the day, and dazzling sky-objects during the night. The Infinity 76 incorporates fun into exploring the exciting world, satisfying kids' curiosity, expanding their knowledge and interest towards learning. It also serves as an attractive home decoration. Our Infinity Reflector Telescope is manufactured by Sky-Watcher, one of the most respected telescope manufacturers - products you can trust, representing great value for money. Indeed, according to the BBC's Sky at Night programme, the Infinity "delivers far better performance than you'd think", and awarded it a very high 92 marks out of 100 for value for money. 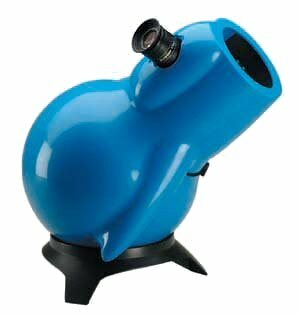 Our Infinity Telescope is a 'reflector' telescope (sometimes called a 'reflecting' telescope). Reflector telescopes use a concave mirror to collect the light coming from the object being oberved (eg the moon), and reflect this up to the eyepiece. The most important thing to look for in a telescope is the quality of the lenses and mirrors. Generally speaking, for a reflector telescope, the larger the diameter of the main mirror, the more light can be collected, and hence the greater the quality of the magnified image. Usually, the more you pay, the higher the quality of the magnified image. This is not always the case though among the telescopes we regularly review. 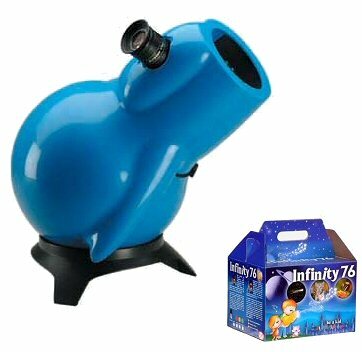 The attractive INFINITY-76 telescope benefits from Sky Watcher's Aspherical Technology, usually only found in larger, more expensive telescopes. The primary mirror is altered during polishing to bring the light rays onto a common focal plane, resulting in sharp images full of detail. This means that the Infinity 76 telescope has what is known as a parabolic mirror, rather than inferior spherical mirrors used on (as far as we know) every other child's telescope. The result is that the Infinity produces remarkably bright and clear images. The INFINITY-76 collects 131% more starlight than the average 50mm toy telescope, bringing hundreds more objects into view. Its intuitive up-down, left-right manoeuvrability makes it a perfect user-friendly telescope for kids. Setting up the telescope is so easy that it is almost ready right out of the box, allowing your kids to easily explore the exciting universe to their hearts’ content. What we also particularly like about the Infinity telescope is that it achieves a very good trade-off between quality and price. The magnification of 30x may seem low in comparison to quoted magnifications of other children's telescopes, however this enables the Infinity 76P to offer a wide range of view and this is all done with optics that are superior in quality to all other telescopes in this price bracket. The result is that the Infinity provides particularly clear and bright images that reveal more in the night sky than other telescopes quoting higher magnifications, which commonly suffer from poor-quality, low-detailed and dull images with such a narrow field of view that children have difficulty in using them. In short, the Infinity enables amateur astronomists - especially children - to discover a wealth of hidden secrets in the night sky, without costing the earth! And, we have to admit, the remarkable quality of the images makes this telescope actually quite fun for adults too! The Infinity 76 has been approved by the TUV Rheinland Co., Ltd.